Let’s Get Serious is one year old! The first podcast episode went live on November 22, 2011. That’s a lot of talking. 26 Episodes later I’m joined by comedian Cameron Esposito. We discuss her show, Side Mullet Nation, what it’s like to host an open mike and her ringmaster duties with El Circo Cheapo. Thanks to everyone who’s taken the time to be a guest or listener! 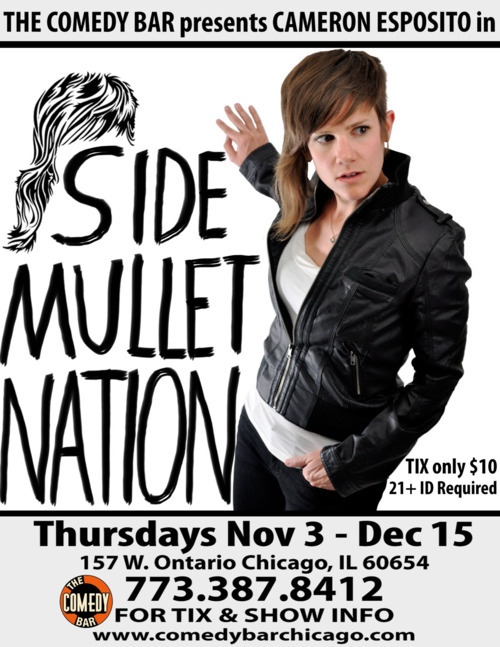 • Cameron Esposito is performing in Side Mullet Nation every Thursday through December 15, 2011 at The Comedy Bar in Chicago and she hosts the comedy open mike every Wednesday night at 9pm at Cole’s in Logan Square. • For more about Cameron Esposito visit therealcameronesposito.com. • Discover all 26 episodes of Let’s Get Serious. • Sign up for my mailing list to receive occasional email updates and follow @seriouspodcast on Twitter. Posted in Comedy, PodcastsTagged Cameron Esposito, Chicago, Cole's, comedy, interview, Let's Get Serious, Logan Square, podcast, stand-up, The Comedy BarBookmark the permalink.